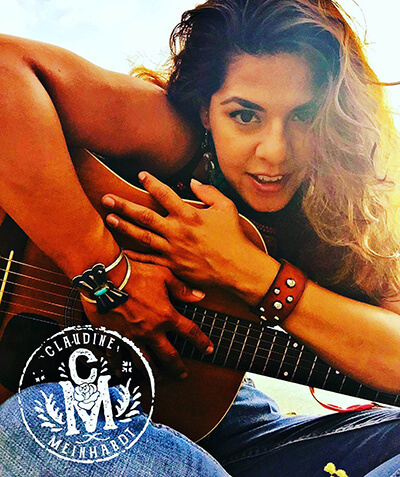 Claudine Meinhardt is a vocalist, guitar player, singer songwriter from San Antonio, Texas. As a teenager she began playing rhythm guitar player for a few rock bands around San Antonio.. Starting in 2011, Claudine began writing and became influenced by guitar playing singer writers such as Susan Gibson, Jana Pochop, Kelley Mickwee, Rosie Flores, Terri Hendrix, Eric Hisaw, Lisa and Roberta Morales. Growing up and currently residing in San Antonio, TX she has been influenced by rock, blues, Tejano, country and folk music in and around the city of San Antonio. Being miles away from Luckenbach, Austin, New Braunfels and San Marcos, influences in South Texas music aren’t hard to find.